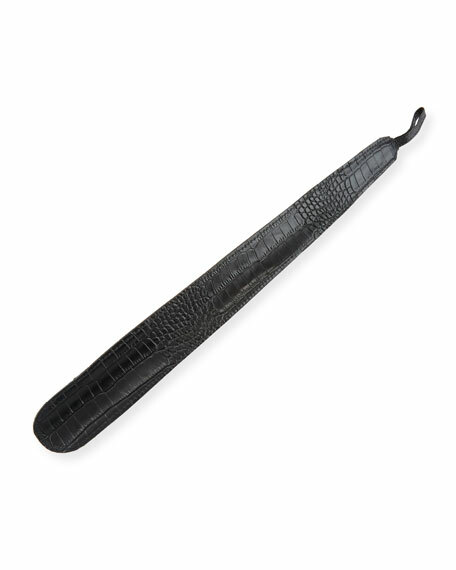 Utile shoe horn in crocodile-embossed leather. adidas by Raf Simons high-top rubberized canvas boot sneaker. 1.5" heel. Round cap toe. Lace-up vamp. Photograph and text logo patches at side. Padded footbed. Lugged rubber outsole. Imported. adidas Primeknit?? trainer with mesh upper. Reinforced, round toe. Lace-up vamp. Printed pull-tab at backstay. EVA midsole inserts for lightweight cushioning. Boost midsole keeps every step charged with light, fast energy. Rubber outsole for traction. "NMD_TS1" is imported. Balmain stretch-knit sneaker with soft leather logo strap. Flat heel with platform. Reinforced round toe. Pull-on style. Pull-tab at back collar. Stretch-sock insole. Goatskin lining. Rubber outsole. Made in Italy. Balmain knit sneaker with logo-embossed leather strap. Flat textured heel with slight platform. Reinforced round toe. Pull-on style. Logo pull-tab at back collar. Padded footbed. Rubber outsole. Made in Italy.